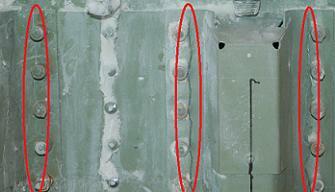 Two more cracks has been found on a stringer adjacent to the two original cracks on Discovery’s External Tank (ET-137). The latest crack was found on the far left of removed Thermal Protection System (TPS) foam on the flange area between the Intertank and the LOX tank, but appears to have suffered less stress than its two neighbors. Discovery was powered up at the pad to provide sampling data, before being put back to sleep, as relatively minor troubleshooting continued on a couple of Interim Problem Reports (IPRs) on the orbiter. With a replacement Mission Event Timer (MET) being installed on Friday – after one of its digits wasn’t displaying – along with work on the Main Engine Controller (MEC) on ME-3, engineers are taking the opportunity to work on problems that were previously cleared for flight by the Mission Management Team (MMT). “OV-103 / SRB BI-144 / RSRM 112 / ET-137 (Pad-A): OV-103 (Discovery) was powered up and down this morning to perform FCP H20 sampling. In addition, SRBs and ET/OI were powered up to take data,” noted the NASA Test Director (NTD) report (L2). “IPR 0054 Forward Mission Event Timer (MET): The forward MET will be replaced today. Discovery will be re-awakened from her slumber on Monday to provide assistance to the MEC retest, as engineers press forward with what may be a potentially smooth resolution to the Ground Umbilical Carrier Plate (GUCP) leak – with the root cause now pointing to the carrier plate as the culprit for the leak during tanking. “IPR 0068 Ground Umbilical Carrier Plate (GUCP) leak: Engineering analysis of the data was performed Thursday and the team’s conclusion was that the concentricity measurements of the SN2 Carrier Plate at the 7-8 O’clock position (where the vent line at Pad A tends to pull on the GUCP) were the greatest out of spec measured to date,” added the NTD. Interestingly, the flight seal has become less of a concern, and despite initial findings pointing to it being “asymmetrically compressed”. This may aid evaluations into the root cause, with only one obvious part of the GUCP hardware being confirmed as out of spec. With the current findings in hand, managers met on Friday to discuss the forward plan (meeting were ongoing at time of publication, updated to note a go to proceed), one which centers around replacing the suspect carrier plate. 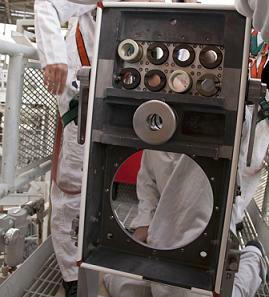 The goal would be to begin the reinstallation of the GUCP hardware to the tank over the weekend, with a further decision on if to conduct a Tanking Test – as was conducted on STS-127’s tank after a second GUCP-related scrub. “The team is ready to begin installation of the SN3 GUCP. An ERB (Engineering Review Board) (will) discuss the initial concentricity measurements of the SN3 GUCP. Based on that discussion, the ERB will either give a go or a no-go to proceed with flight seal and ground QD installation,” the NTD noted. Following the observation of two cracks on either side of one of ET-137’s stringers – likely responsible for the defect noted in the intertank flange foam shortly after the scrub was called – plans have been drawn up on both access and repair options. With a plan approved to complete all the required repairs at the pad – thus avoiding what was always an unlikely rollback to the Vehicle Assembly Building (VAB) – engineers decided to install a doubler to the defect area prior to refoaming the areas with BX foam. As noted, engineers opened an Intertank access door, allowing them to ingress the tank’s structure – which is located in are area between the LH2 and LOX tanks. At the same time, additional foam was removed from the stringer area, in order to check adjacent stringers for any additional defects. “IPR 133V-0072 ET LO2/IT stringer crack: Additional foam trimming was performed. Some additional foam trimming will be performed Friday to expose adjacent stringers making sure no additional cracks exist,” the NTD noted on Friday morning. That proved to be a wise decision, as a third crack was observed on the stringer to the left of the original defects. The latest crack does not appear to be as “bad” as the other two defects, via hi-res photos acquired by L2 – likely because it has failed to “open out” along the fracture line, potentially pointing to less stress involved when compared to the original two cracks. Further updates will be added when additional information is forthcoming. UPDATE 1: GUCP Carrier Plate installation ongoing, requiring two torque operations. Doubler installation ongoing, with set-up for TPS foam spraying operations in work. Flight Seal is installed. UPDATE 2: Four cracks (in the two stringers) observed. First stringer is removed for R&R. 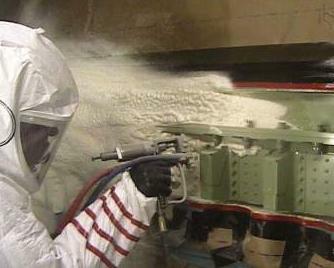 ERB to discuss further foam removal on Monday. Will be a new article later on Monday. All images via L2 and NASA.